Back in July when I interviewed local filmmaker Rick Walters, he told me about a really special idea he was throwing around with his colleague Moses Olson that depicted Rick as a Humphry Bogart type character. He’s a big fan and it immediately got his gears turning. Here is why I like this project. Rick dreamt of one day playing a lead role that was dashing and debonair. No more villains and unlikable characters! But the opportunities didn’t come. Moses had a great idea for a story with Rick playing a character inspired by one of his heroes. If you don’t have what you need artistically at your disposal, you go out and get it or you go within and create it! By the end of August, they were filming it. So just to recap, Rick wrote a complete script in July, found 2 great co-directors, producers and cast, revised the script, did the pre-production shuffle and were up and shooting by Labor Day weekend. I would say POWSKI to that. I would. Since tailoring our profile photo shoot of Rick to Bogey, I’ve kept in touch with the process because frankly I find making great art collaboratively around day jobs and school and life obligations tremendously impressive and admirable. Independent artists know how to stretch a dollar, survive on little to no sleep and generally know just how far “whatever it takes” actually goes. 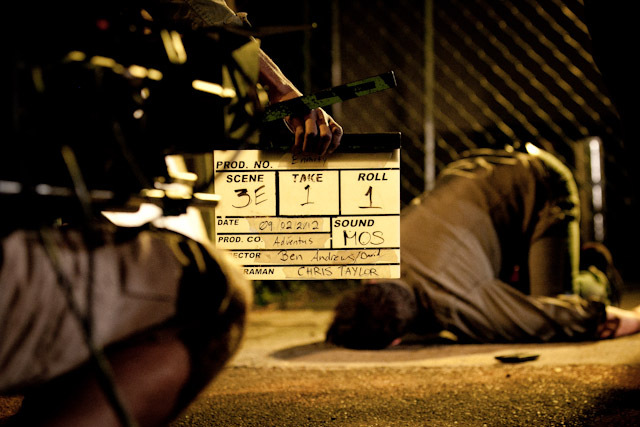 The majority of the film was shot in 3 days. I had a chance to visit the set and ask a few of the principal cast and crew some questions about their experience. What are some memorable moments from working this set or other creative highlights from the process? David: Cramming to get our last shots and setting off the smoke alarm. Tense! Ben: Lots of blood on Rick Walters is always enjoyable. When you have a project with such a short timeline everyone has to step up and collaborate beyond their role. This was one of my favorite collaborations of all time. Not a lot of ego and a whole lot of hard work from the entire crew. Rick: Really just the sheer force of nature that was the production staff. 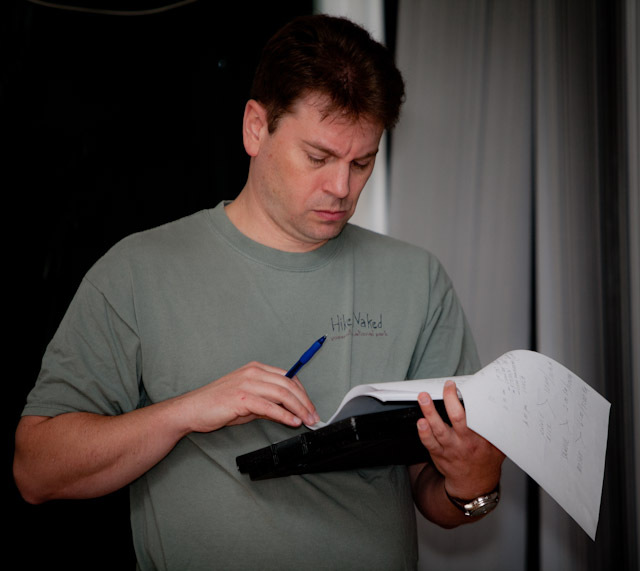 Steve Harshfield, the Unit Production Manager and 1st Assistant Director made magic things happen. David Hogan and Angela Dimarco from Mighty Tripod productions contributed both time AND money to make this happen. Angela is an amazing producer, with a maternal assertiveness that made working on set comfortable and efficient. Steve: How quickly and naturally the partnership of the producers developed. Witnessing for the first time the raw talent – in front of and behind the camera – that Seattle has to offer. And the blood – Kate Dixson’s blood was A-M-A-Z-I-N-G.
Samuel: This was my first film so it was all a highlight. Kate Dixon from Killer Makeup FX was truly amazing indeed. David: Directing is really hard. I have *a bit* more sympathy for the directors I have put through lambasted for not giving enough “direction” on set. Rick: Besides the drunken, prison buff Gang banger wanting to shank me? Naw. Steve: We were on a very short timeline. At first, it looked like it was going to be a major challenge. But it all came together, and it was a life-altering experience. What do you think is special about Seattle film culture? David: I think the film scene (at least on the low/no budget level) in Seattle is very supportive, even though things are rather incestuous. We get excited about each other’s work, raise the bar by keeping tabs on other projects, and don’t seem to suffer from hyper-competitiveness or back-stabby behavior. Yet. But, what the hell do I know? I am a noob. Ben: We have a small, supportive, tight-knit community. Steve: The only city I have to compare it to is L.A., and I’ll tell you there is absolutely NO comparison. Seattle is a real film COMMUNITY. Everyone I’ve met has been gracious, supportive, and helpful from every which direction. If you ask for help and someone can’t do something themselves, they’ll go out of their way to make sure you get in touch with someone who CAN. They genuinely care about your projects and your success, because they know as each individual in the Seattle film community is lifted up, so, too, are they. I know, without a doubt, that Seattle can give L.A. a SERIOUS run for its money! Samuel: This was my first film acting in. I really wasn’t aware of our local film world. I was blown away by the whole thing. 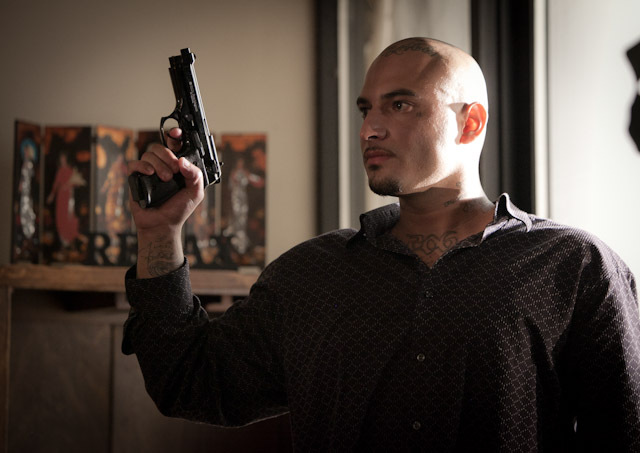 I think when people think movies they don’t think about Seattle especially gangster flix like this. Hopefully this film will get everyone’s attention. Any words of advice for youth filmmakers? David: Words of advice? Follow your heart and the footsteps of good people who will show you how to be the best version of you. Ben: Stay true to your vision, think outside of the box, and realize no one else in the world has the talent that lies within you. Rick: Do your homework. Raise your own money. If you don’t know how to do it, ask somebody (I have googled the stuffing out of some film questions). If you truly want to work in films locally, volunteer. Put it some sweat equity as a production assistant. Find someone on set who knows what they are doing and make it your mission to learn everything they know. I am not talking about just the technical side of things, but learn the customs and courtesies. Learn how the hierarchy on a film set works. Learn the vernacular. Be humble. 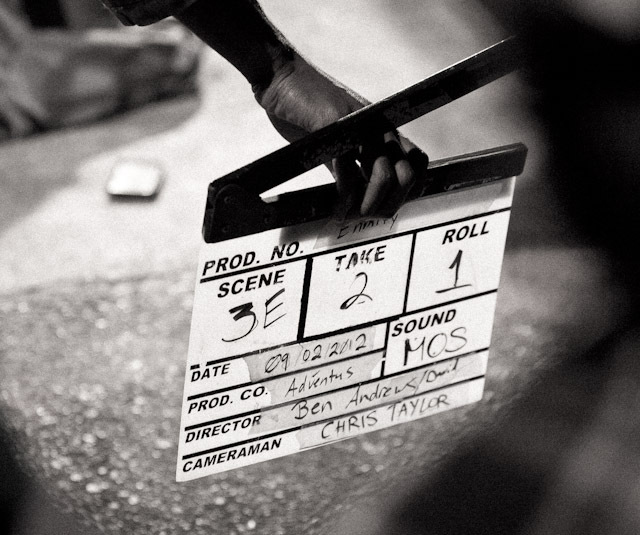 Have a thick skin and make movies. Pretty simple really. Samuel: If its something you’re really interested in, just go do it . Even if you think you’re not that good. You might be surprised. Any projects you have coming up that you are excited about? Rick: Man there’s so many. I am 1st AD on Locally Grown, a web series. 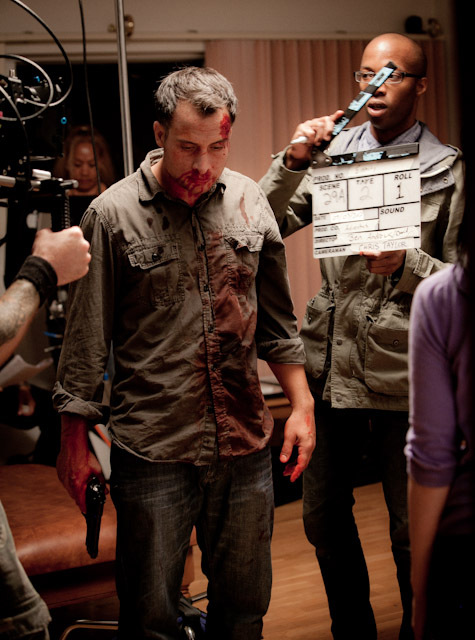 1st AD on the short thrill “Deadline”. Still working on Enmity. Adventus Films has a number of commercial projects in the pipe, but we just completed shooting on the pilot for a web series called “Get Real Tacoma” for OMH Creative out of Tacoma. Finally, I get to play the romantic lead in the music video for Viktoria Tocca’s song Besame Mucho directed by Moses Olson. Steve: OMG YES!! Soon after I moved to Seattle, a production company in L.A. offered to option my best script, Quanta. After several weeks of back and forth, we couldn’t come to an agreement, so I walked away. After consulting friends, colleagues, and family, I decided to direct and produce the script myself in SEA-TAC. 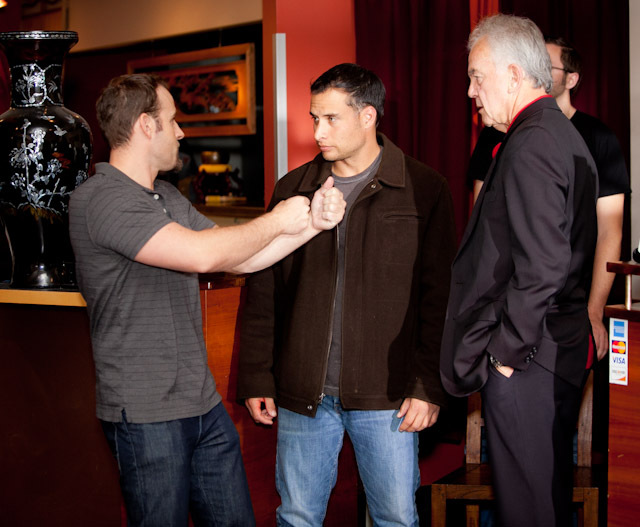 It was through my preparations for that endeavor that I met Rick Walters and many other wonderful people who were not only excited by the script, but also by the prospect of helping me make the movie in Washington. We had such a high after wrapping Enmity that I immediately sent an email to Angela, David, Ben, Chris Taylor, and Rick and said “Let’s figure out if we can pull this off!” They’ve all been amazing sounding boards… We don’t quite know what the production team of Quanta might look like once we really get in gear, but their input and genuine excitement has really inspired me!! Ben: He’s intense. 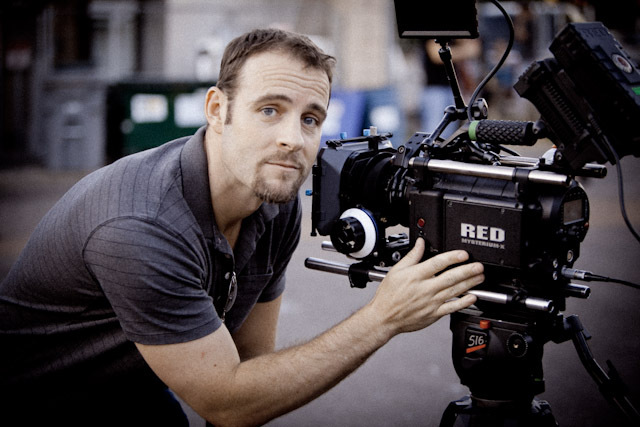 But truly cares for the craft and more importantly he is passionate about making film is Seattle better. Rick: David Hogan is a technical actor, and this was his film directorial debut. He pushed me and pulled me in directions I would not have gone on my own. That was a serious unintended bonus for me. Steve: David Hogan’s approach as co-director on the film took the actors below the surface, helping them find those moments of anger, helplessness, and vulnerability. As macabre as it might sound, it was almost like watching an undertaker at work, peeling back the layers of the actors to show them their own insides, then carefully stitching them up and allowing them to encapsulate those thoughts and feelings in their performances. Samuel: I kinda felt out of place at times. I’m from the streets and grew up hanging around gang members and drug dealers but David made me feel comfortable. David: Working with Ben? Ha! Well, the above comments should reflect a bit of that working relationship…I think Ben and I work well together. Ben has more experience than I do behind the camera, and I am a bit of a bull in a China shop when I get worked up about something, but his even demeanor, and “let’s work this out” attitude smoothed things out when they got hot. Rick: Ben is deceptively calculating. There are several styles of leadership, Directive, Collaborative, hands-off etc… Ben has a gift for bringing people up to his level and empowering them to hit a mark on their own terms. That’s a gift and an asset. 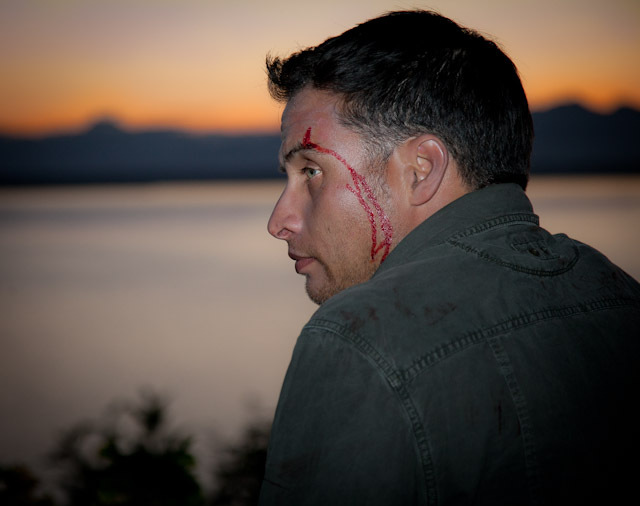 Steve: Ben clicked naturally as a co-director on Enmity. As an actor himself, he didn’t allow his own acting chops to color or cloud the performances of the cast. He told them what he wanted, gave them some thoughtful insights into choosing a wardrobe for their characters, and struck the right balance of nutty and professional when the cameras rolled. Samuel: Ben was very cool he kept giving me tips and it helped me out a lot when it was time to shoot. David: I had not worked with Steve Harshfield before, but I found him to be an absolute gem on the set and a real fine 1st AD. He is highly organized and has a wonderfully enthusiastic energy. Ben: A breath of fresh air. Rick: Steve is a the sleeping giant of Seattle Film. He was working in LA before he came up here, and he’s (almost subversively) made a huge mark in our community already by networking. 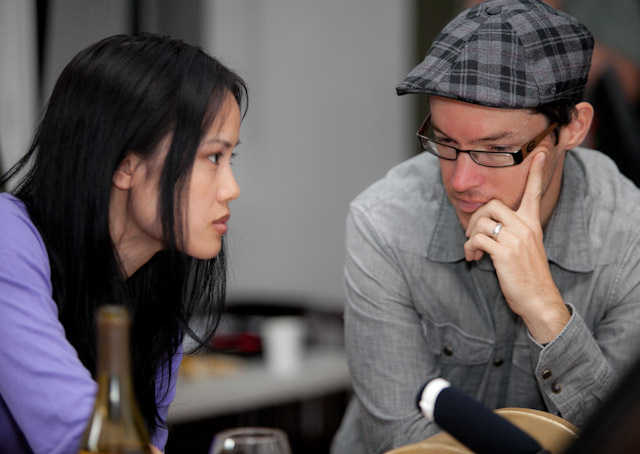 The first time I met him he took me out to sushi to talk about his feature script “Quanta”. Before I read the script, I almost discounted it and added it to a pile of scripts that I am “waiting for time” to read, but he is a very compelling pitch man. I read the 95 page draft and I was flabbergasted. It is by far the best original script I have read. It’s serendipitous that he was available to come work on Enmity, and he did so without asking for anything. He simply took initiative and made it happen. You’ll know much more about this man from other sources soon. Watch for him. Samuel: I can tell that he’s very serious about his work and that made me come home and work harder on my music. David: Working with Rick on set is great. He listens well and is open for direction. And, his experience as a producer, 1st AD was helpful, too. But, we tried to keep him focused on wearing the “actor hat” exclusively. Ben: Rick is the shiznit. Talented, motivated, funny, serious, and most importantly puts his actions where his mouth is. Steve: Rick has gone above and beyond to stretch his limbs as an actor. Yes, every once in a while he had to be reprimanded for playing producer or AD, but at the end of the day, Rick started feeling more comfortable in his own skin as a performer. I’m looking forward to continue watching his development as an actor! Samuel: That dude is awesome. I was very impressed by his acting abilities. He motivated me to get my mind in my character. David: Samuel is not an actor by profession or hobby, but he is a performer. An entertainer. He had a great attitude on set, and, believe me, a good attitude and a willingness to listen and learn pays HUGE dividends on a film set. While Samuel was unfamiliar with the inner-workings of a film set, he took direction very, very well. He was an eager contributor and, it was a thrill to have a “non-actor” on the set who was ready and willing to play! Rick: From the first time I talk to Samuel on the phone I was impressed with how hungry he was to become part of something artistic. He’s obviously very into his own work as a rap artist but he was more than willing to step into the film making arena. Steve: I enjoyed working with Samuel. Despite his rough exterior, he was a nice personable guy. Enmity is currently in the final stages of production. It’s been a lot of fun to watch this movie get made. The Seattle film community is collaborative and supportive. I’m proud of all of you guys and can’t wait to see this film.